Dr. Weaver-Lee joined KCHC as an OB/GYN in September 2015. She completed her undergraduate degree in Microbiology at Howard University. 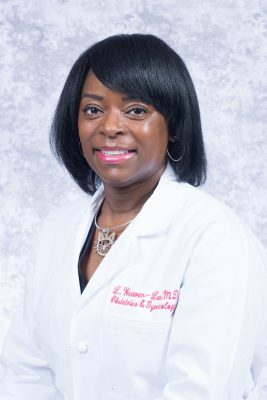 She spent several years working as a marine biologist in Charleston, SC but fulfilled her dream of going to medical school in 2000 at the Medical University of South Carolina in Charleston. She earned her MD degree there in 2004. She completed her OB/GYN residency at East Carolina University. Dr. Weaver-Lee has a passion for taking care of women and ensuring their maximal health—both in their childbearing and non-childbearing years. Dr. Weaver-Lee was born and raised in Washington, D.C., where her family still resides. She is married and has a stepdaughter. Dr. Weaver-Lee has two cats, and her hobbies include Zumba and movies.